The small 6-by-12-foot houses are only large enough to hold a set of bunk beds. Even though the houses are not made with plumbing or electricity, the facilities help make living much more bearable for homeless individuals. “They (homeless individuals) were living under tarps and thrown over branches,” Payne explained. Payne, who has a background in industrial education, encouraged his students to begin soliciting community businesses for material donations such as lumber, metal and linoleum. With the support of local businesses, both homes were fully funded. The first home the chapter built was delivered to a man and his wife living in the homeless community in February 2018. The second will be delivered this month. Building the houses was used as a teaching tool in a building construction course. 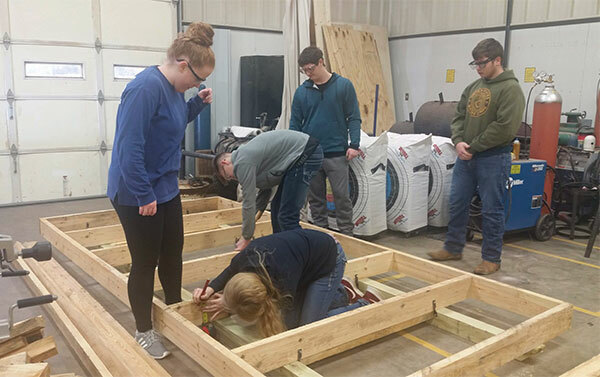 While building, the students had the opportunity to learn about planning, designing, estimating the required materials and different tenants of construction for the small houses. Aesthetically, the homes are very pretty inside even though they are only made to house two people. The walls and ceilings are made from tongue-and-groove pine lumber with two windows for ventilation. To put a personal touch on the houses, Payne left a spot on the wall for each student to sign his or her first name around the words “From Your Friends at Greenville FFA.” The students also used their artistic ability in art courses to paint patriotic paintings to decorate the interior walls of the home. The homes are delivered to a homeless community in the St. Louis area with mostly veteran inhabitants. While Payne is not certain the recipients of the first small home were veterans, he is certain the person who received the home this year is a veteran. Payne is encouraged by the commitment the Greenville FFA members have made to building the homes. While they are learning crucial building skills, they are also helping someone stay warm at night.